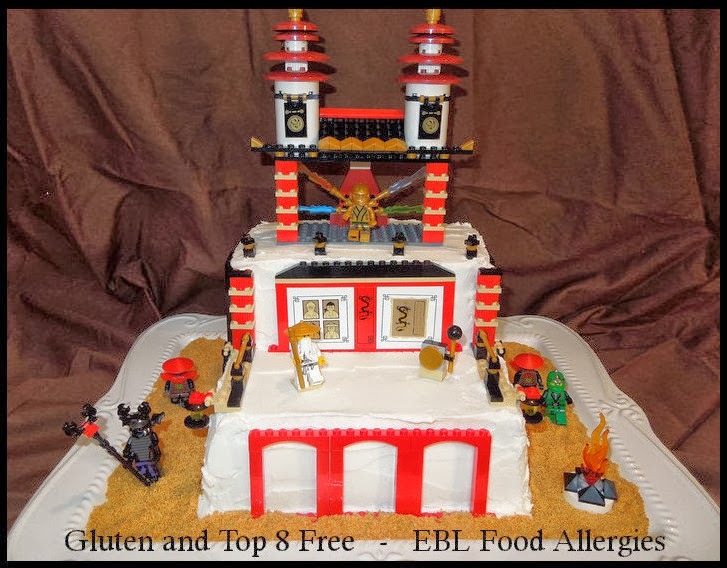 My son’s long list of food allergies makes purchasing a safe birthday cake impossible. So, every year I take on the challenge of creating a cake that not only tastes good but also looks great! 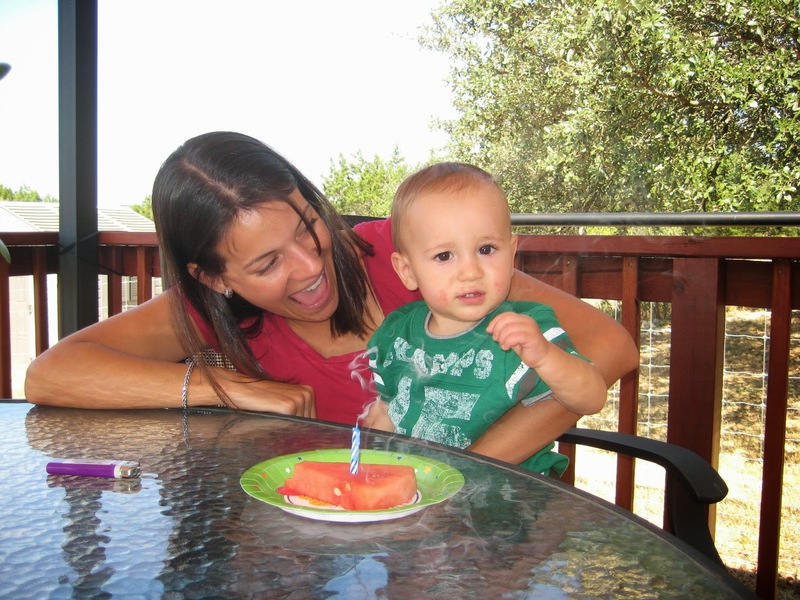 His first birthday “cake” was a slice of watermelon with a candle in it. That was before I knew anything about cooking allergy-free. I used a simple gluten free chocolate cake mix and followed the directions on the back of the box. Is that cheating??? I needed to keep it simple! Cherrybrook Kitchen came to my rescue! How awesome is it that there are more and more companies producing allergy free products??? LOVE THAT! I also made a strawberry filling to go in between each layer of cake. THIS is what made the cake taste FANTASTIC! I just blended 1 pound of strawberries with 1/4 cup of raspberry jam in my blender until it looked like a relish consistency. I piped a layer of frosting on the outside of each layer to hold the strawberries in. YUM! Then I layered the other cakes on top of each other, alternating with strawberry filling. Next, the frosting. For this I needed the help of a professional, Cybele Pascal. I used her recipe for Velvet Frosting, which can be found at her website here. It tasted fantastic and worked perfectly! Now the FUN part! The LEGOs! The boys in this house go CRAZY for LEGOs! What better way to decorate a cake easily then to create the design with toys and just stick them on? EASY! I threw some crackers in a blender to create the sand, which also hid the flat LEGO pieces that the men are standing on. I used existing LEGO ninjas and purchased a Ninjago® set which we also used as one of his gifts. The cake is wheat free, dairy free, soy free, gluten free, egg free, and nut free (as well as fish free and shell fish free, obviously) which makes it Gluten and Top 8 Allergen Free! I was so excited about this cake that I started passing my phone (with the picture) around to all the doctors, nurses, and bloggers at AANMA’s first USAnaphylaxis Summit in Washington D.C. How could I resist? I was in great company and they could all appreciate the effort of cooking allergy-free. The only thing left to do now is blow out the candles…Happy Birthday Little Man. Love you! Interested in seeing the Allergy Friendly Cars2® Cake that I made? Click HERE. Ahhhhhmazing!! Simply amazing! You are so talented and your boys are very lucky to have you as their mother. Wow! Very, very impressed! What a great mom! Looks great !. Im sure tasted good too !